Following on from what I described as an unpredictable Summer in Melbourne, Australia, that brought us extremes of weather in the form of storms and flooding, Autumn 2010 was nowhere near what you would describe as “normal” either. The state if Victoria recorded a record 123-day run of temperatures over 20 degrees, and the 12-month record is the hottest mean temperatures seen in the state since records began over 150 years ago. As a result of the extended warm weather, the garden was a most unusual sight for this season – all lush, green and vibrant, with almost not a single fallen leaf in sight! Summer annual plants which would normally have been long dead were still flowering and bearing produce while the Autumn annuals were doing the same. Plants whose seasonal growth patterns dictate that “never the twain shall meet” were growing side by side for the first time, almost in defiance of their regular seasonal windows of growth. I’ve never seen climbing beans, snow peas and broad beans all flowering at the same time, along with tomatoes and chillies! 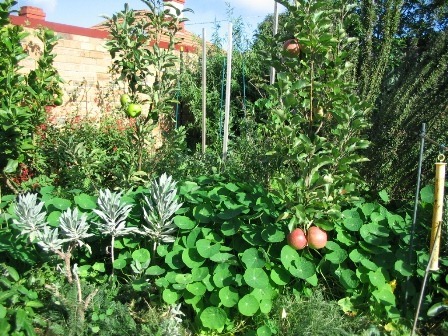 Here are a few photographs of the garden, you’d be hard pressed to guess that this is well into Autumn! 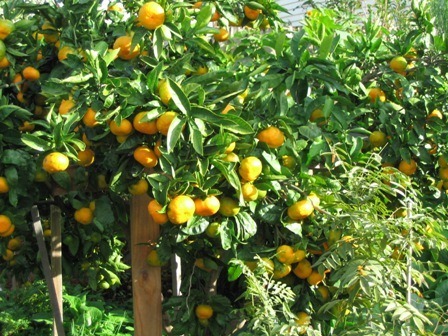 This season has also been outstandingly productive, with record yields from the pomegranate and mandarine trees. 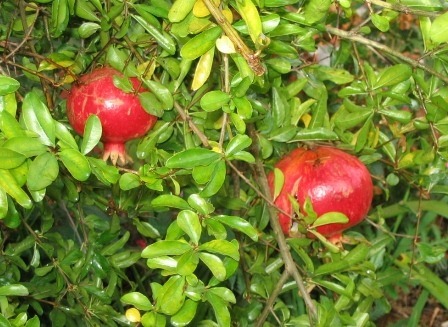 The pomegranate tree is approximately 3m high by 2.5m wide, and produced over 47kg of pomegranates.Most of the fruit were as large as grapefruit, up to 800g in weight. Incidentally, no fertilisers are used in the garden, only compost, worm casting liquid and a token amount of seaweed extract. The garden beds are constantly mulched, this is in effect “sheet composting”, where the mulch constantly rots down to enrich the soil. Two small bags of manure were added to the whole 85 square metres of garden beds – the manure was given to me for free by a friend after helping them out with their garden. 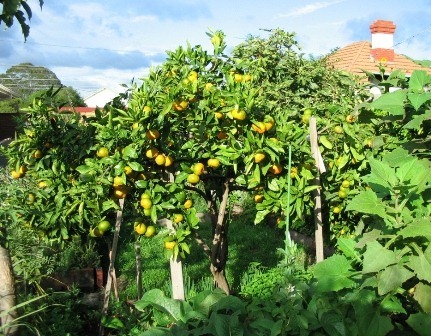 Not to be outdone, my small mandarine tree, which measures approximately 2.5m high by 2.5m wide, and which produced 25kg of mandarines last year, managed over 61kg this year. It was so overladen with fruit that it had to be braced with wooden stakes to which the branches were tied so they wouldn’t break! The simple secret to this prolific yield is an underplanting of comfrey growing underneath and around it, about 1.5 square metres worth. Comfrey leaves are so nutrient rich, they are a “green manure”, and when cut and left to rot down, they make for one of the most potent plant foods. Comfrey is actually a plant that “mines” nutrients, its deep tap roots can “drill” down deep into the soil to access nutrients that other plants can’t get to, it concentrates them in its leaves, which eventually die off and rot down on the top of the soil, making them accessible to other plants. Comfrey also makes an excellent “nutrient trap”. 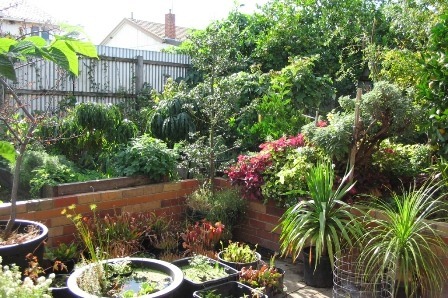 If you garden is on a slope, then water, with dissolved nutrients, will run down the gradient and carry away the nutrients from your garden. By planting a garden bed filled with comfrey at the bottom of the slope, the water carrying the nutrients will be absorbed, and the nutrients will end up in the comfrey leaves rather than washing away. 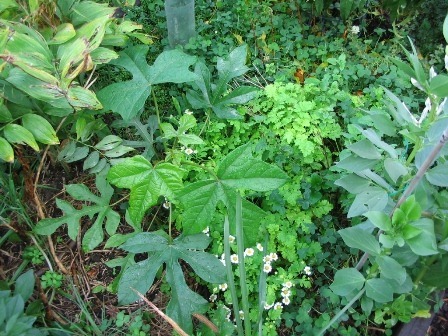 Cut the leaves and place them around other parts of the garden, or compost them, to re-use the nutrients. Comfrey is definitely a useful permaculture plant with many other uses that no sustainable garden should be without. It is propagated from root cuttings, and when you have it growing, it’s very hard to eradicate, which, in my view, is a good thing, as you want plenty of it in the garden! 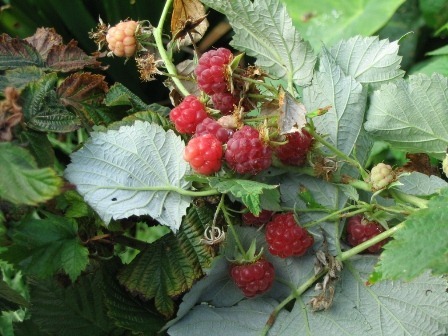 I have two plantings of raspberries, which are 2.4m (8’) long, and are located at the edges of garden beds. They are supported star pickets with wire strung between them, the resulting trellis stands around 1.5m above the ground. Since the trellis borders an existing bed with other plants growing in it, the raspberries take up very little space, probably a 30cm wide edge of the bed, and therefore make efficient use of vertical space. Being plants that don’t like direct sun, then can make good use of the shadier borders of the garden. 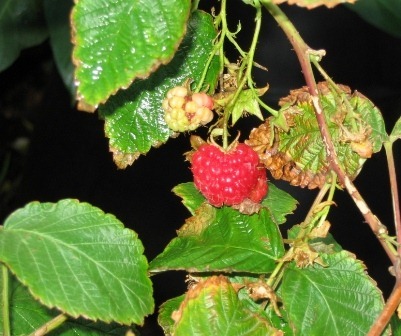 This is another variety of raspberries I have growing, this one produces huge berries about four times the size of regular ones, and bear from late November to mid May. With only four plants growing in a tiny 30cm x 50cm space, yield was a reasonable quarter of a kilo, nearly two punnets worth of produce. 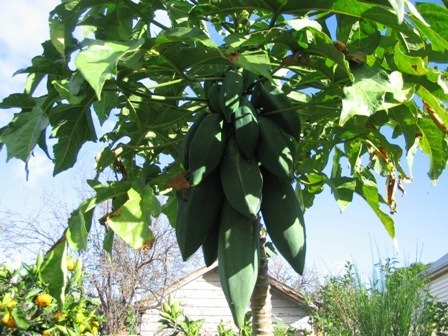 Another heavy bearer which is preparing for a heavy summer crop is the Babaco tree, a relative of the Paw Paw or Papaya tree, also known as “Champagne fruit”, because of the delicious tangy effervescent (fizzy tasting) tropical fruit produces. 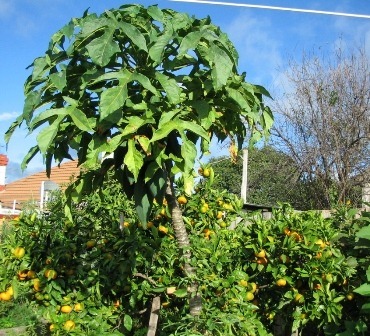 A fully mature tree is said to produce up to 100kg of fruit a year. Fruit are quite large and heavy, well over 0.5kg a piece. Here’s my three year old tree, it was planted in the garden two years ago, and stand approximately 2.1m (7’) high. 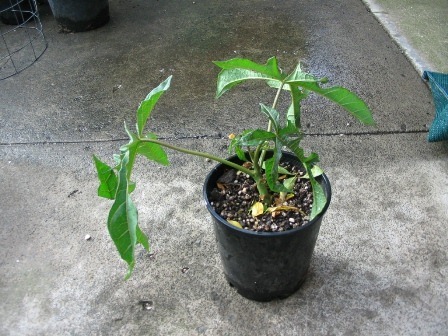 Propagation of babaco is easy, which is fortunate, because they are not exactly cheap to buy. 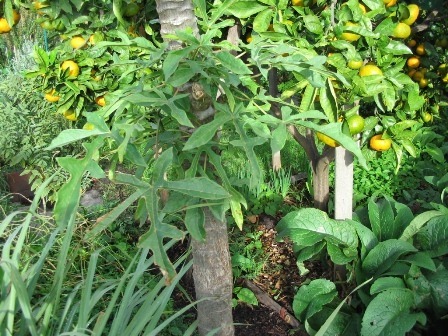 Small branches shoot out along the stem, and when they reach about 5cm (2”) long, they can be cut off and planted in well draining propagating medium, and placed in a shady spot till they grow roots. The suggested method for propagation which you find in books is highly questionable in my experience. They suggest decapitating the tree, and chopping up the stem into short sections, which are then placed in propagating medium. The result of this dubious method, from what I’ve seen at other people’s attempts, is that the centre rots out of the section and the cuttings usually die. Using my technique, I have a 100% success rate. Here is one cutting that is planted up in a perlite/potting mix blend in a 15cm wide (6”) pot. In a few weeks it will grow roots, and when new leaves start growing, it can be planted into the garden in a position that has good sun. Here is the same cutting planted out in the garden, it’s been there for about a month, and is about 30cm (1’) tall now. 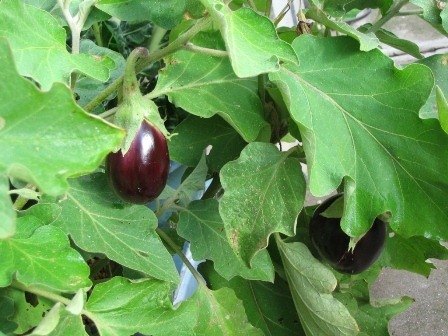 Another impressive piece of growth here is from the “eggplant tree”, which was featured in a previous article explaining how to graft eggplants onto a devil plant. 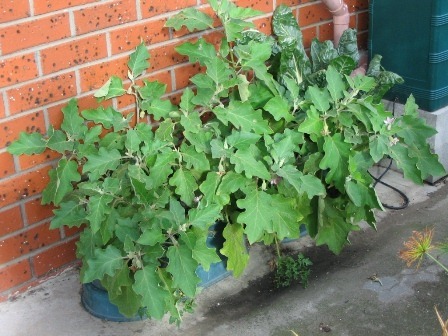 The “tree” pictured below is about 1.8m (6”) high, and has dense eggplant foliage, as is evident in the picture below. The test will be to see if the grafts survive the cold of Winter. The hydroponic eggplants which yielded the scions for the grafting, doing pretty well considering I planted them way too late in the season. 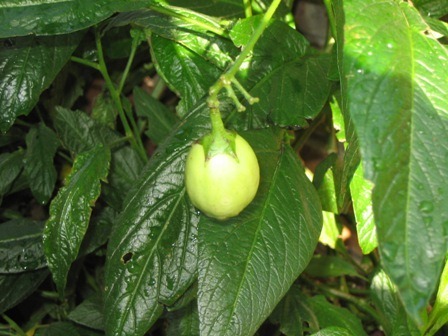 The same hydroponic eggplants bearing fruit, thanks to the extended heat of the unusually warm Autumn. 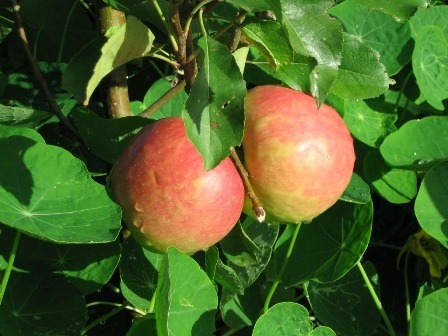 As previously mentioned, most of the fruit trees in the garden are too young to produce, as the garden is not even two years old yet. There’s the excitement of seeing each tree bears its first fruit, and the enjoyment of literally tasting the fruits of your labours! The Apple trees, Pink Lady and Granny Smith (which are each other’s pollinators) produced a few handfuls of large, tasty, fragrant fruit. What was interesting is how these apples compared to the ones in the large chain supermaket, and frankly, the mass produced stuff bore no comparison to the home-grown organic fruit. 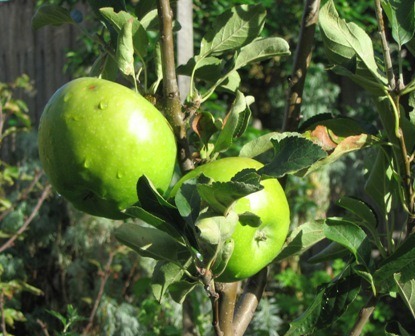 My apple trees are just three feet tall, and bore fruit over twice the size of the commercially produced apples. That’s just the start. The home grown apples had a rich apple fragrance straight off the tree, and the most delicious taste, while the small, wax polished supermarket apples have no smell whatsoever as whole fruit, and the flavour is quite dull and lacking by comparison. Now, logic would tell you that the delicious tasting organic fruit would have way more nutrients than its waxed and polished, miserable, tasteless, chemical-fertilizer grown counterpart. Basic botany would tell you that growing a tree in a nutrient rich soils, which it has evolved to grow in, would produce a more nutrient packed fruit than would a tree growing in a nutrient depleted, chemically fertilized dustpan, essentially inputs equals outputs, but as it would happen, small groups of agri-business funded scientists, disseminating their propaganda in a showcase of “bad science” to support vested interests, would have you believe otherwise. UK and US government statistics indicate that levels of trace minerals in fruit and vegetables fell by up to 76% between 1940 and 1991. 34,35 In contrast there is growing evidence that organic fruit and vegetables generally contain more nutrients than non-organic food. Sources: McCance & Widdowson (1991) The composition of foods. MAFF and the Royal Society of Chemistry. Bergner P (1997) The healing power of minerals, special nutrients and trace elements, p. 312. Prima Publishing, Rocklin, CA. The Soil Association conducted a systematic review of the evidence comparing the vitamin and mineral content of organic and conventionally grown food. It was found that, on average, organic food contains higher levels of vitamin C and essential minerals such as calcium, magnesium, iron and chromium. Source: Soil Association (2001) Organic Farming, food quality and human health: a review of the evidence. An independent review of the evidence found that organic crops had significantly higher levels of all 21 nutrients analysed compared with conventional produce including vitamin C (27% more), magnesium (29% more), iron (21% more) and phosphorous (14% more). Organic spinach, lettuce, cabbage and potatoes showed particularly high levels of minerals. Source: Worthington V (2001) Nutritional quality of organic versus conventional fruits, vegetables, and grains. The Journal of Complimentary Medicine, vol. 7, No. 2, p. 161 – 173. A report jointly produced by The Organic Center and professors from the University of Florida Department of Horticulture and Washington State University provides evidence that organic foods contain, on average, 25 percent higher concentration of 11 nutrients than their conventional counterparts. The report was based on estimated differences in nutrient levels across 236 comparisons of organically and conventionally grown foods. 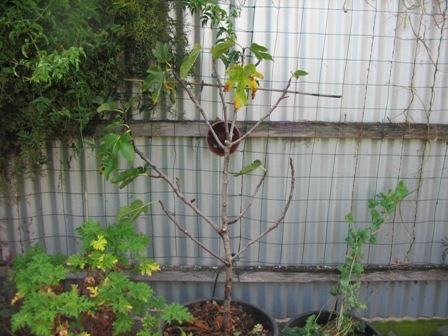 Going back to utilisation of space, I decided to convert a container grown fig tree into an espalier, that is, grow it in a two-dimensional plane, or if you will, grow it flat. The process is simple, trim away any branches that grow forward or backward, and tie down the sideways growing branches to some kind of support after you bend them into the position you need them to grow. The tree is fastened to the wire mesh which is attached to the fence, and the horizontal stick near the top is being used to bring the vertical tips into line so they lie in a flat plane. 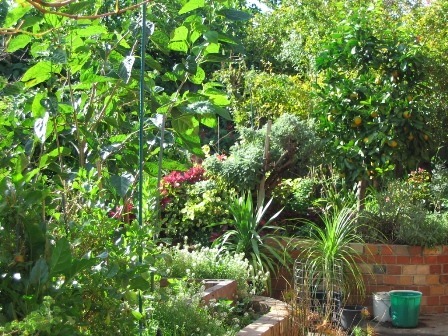 The round object which you can see near the centre of the tree is a plastic pot temporarily positioned between the fence support and the tree to push the tree forward to straighten the bend in the trunk of the tree. 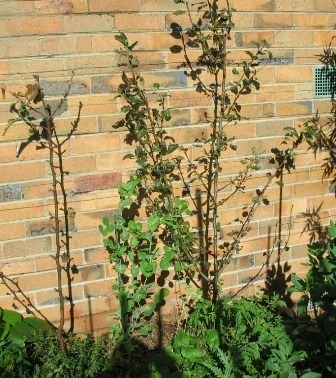 These are my espaliered pear trees, since they are almost dormant, I’m using the trellis to grow snow peas, which will die down when the trees start growing again. This way, space isn’t wasted, there’s always something growing in every spot, and the productivity per square meter is increased annually. 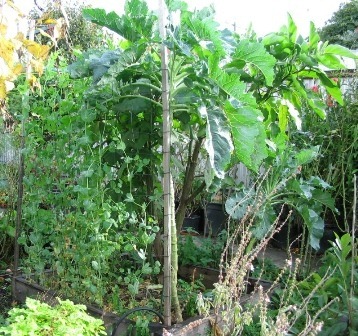 Furthermore, since a principle of permaculture is that design elements serve more than one purpose, the peas are a nitrogen fixing legume, and capture nitrogen from the air and fix it in the soil, which will be available to the trees when the peas die down and the trees start growing in Spring. 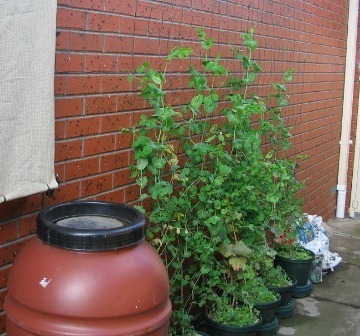 The leaves and stems of the peas wil dry to become pea-straw, which will provide mulch for the tree also. 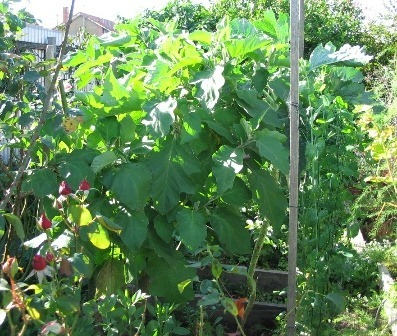 Again, in the picture below, on the left, is a trellis constructed of wire mesh stretched across two wooden stakes at the edge of a raised garden bed, providing over 20 square feet of additional growing space for even more snow peas. Experimentation is always fun and educational, last year I grew all my Pepino plants hydroponically, this year I propagated cuttings and planted them in the garden to grow organically. 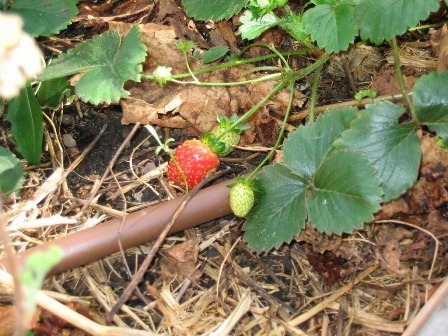 The first fruit are beginning to appear, as shown below. When these little plum sized fruits turn yellow and develop their characteristic purple stripes, they’ll be ready to harvest, and it will be interesting to compare them to last years hydroponic produce to see if there’s a difference in taste. 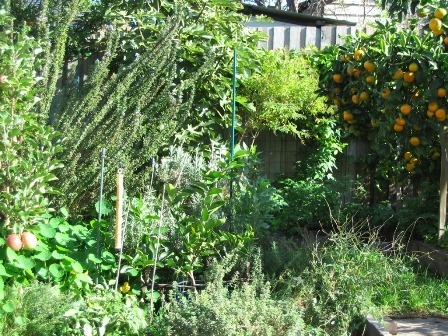 The Autumn rains not only water the garden, but wash over the two worm farms that I use to process fruit and vegetable scraps, and the worm castings get a good wash a yield a good quantity of work casting liquid. Shown below are two four litre buckets filled with nutrient rich liquid after the previous night’s rain. 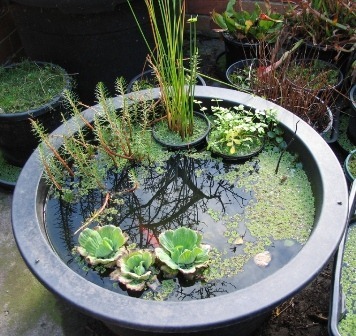 This is diluted and used right around the garden. One thing you soon realise about gardens is that they are living things, that grow and change as they adapt to their surroundings. While some parts are static, the man-made structures, we can remodel these too, to keep with the dynamic nature of the garden. This is a great opportunity to get creative, and to participate in the process of change that abounds in the garden by becoming a very agent of change itself. My creative efforts during one weekend went into tearing down and rebuilding my water garden. Below is a picture of how it ended up looking just after completion. It will eventually “grow” into it’s intended design and shape in the next few months as the weather warms up, and half the enjoyment is setting up the foundations of the design and waiting to see how it unfolds under it’s own living motion. That wraps up the second Autumn since I first built this garden. What awaits is a winter of dormancy for most of the plant life in the garden, the point where it reaches its lowest ebb, where life lies still awaiting the return of the sun’s warmth. With two seasons of highly irregular weather, right through Summer and Autumn, one wonders whether Winter has any surprises planned too! Time will tell….